In common Jewish parlance this word is used to signify that a man is a heretic, unsound in his belief, or lax in his religious practise. The word is derived from the Greek 'Eπικύρōς;, but Maimonides (Commentary on the Mishnah, Sanh. xi. 1), deriving it from the New Hebrew = freedom, explains it to mean one who refuses obedience to the Law. In the Mishnah (see also Acts, xvii. 18) the word evidently means an adherent of the Epicurean philosophy: the context shows this clearly. It reads: "All Israelites have a share in the future world. The following, however, have no share in the future world: He who says there is no resurrection [the words are, as Rabbinowitz has proved, interpolated], he who says the Law has not been given by God, and an " (Sanh. x. 1, Gem.90a). There can be no doubt that Apiḳoros, in this connection, refers to a man who refuses to believe in life after death. Incommenting upon Num. xv. 31, Sifre (Num. 112) says: "For the word of the Lord he has despised; this is the Sadducee: and his commandment he hath broken; this, the Apiḳoros." The Talmudic authorities of the third and fourth centuries either did not know the real meaning of the term or extended it intentionally. Some say: "Apiḳoros is one who despises a rabbi, or who insults his neighbor in the presence of a rabbi, or one who says, 'What good did the rabbis do to us? They study Bible and Mishnah [for their own pleasure or for their own benefit].'" Another opinion sees the type of the Apiḳoros in the school of Benjamin the Physician, who taught: "What good did the rabbis do to us? They have neither permitted the raven nor prohibited the dove," evidently meaning that their whole work was of little consequence. Another opinion sees an Apiḳoros in a man who speaks of the rabbis disrespectfully as "these rabbis," or addresses his teacher by his name instead of calling him "Rabbi" (Sanh. 99b, 100a). In the Tosefta (Sanh., ed. Zuckermandel, xiii. 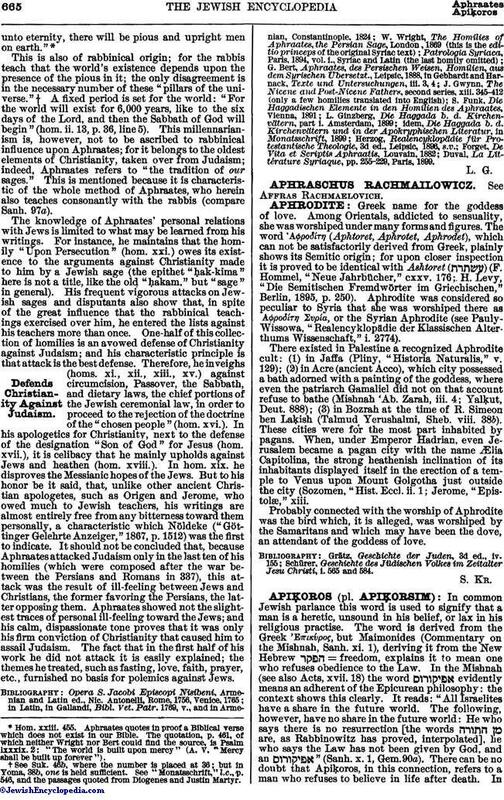 5, p. 43) the term is evidently used in the stricter sense of the materialist where it is said: "The Minim [Judæo-Christians], the apostates, the informers, and the Apiḳorsim are punished in hell forever." 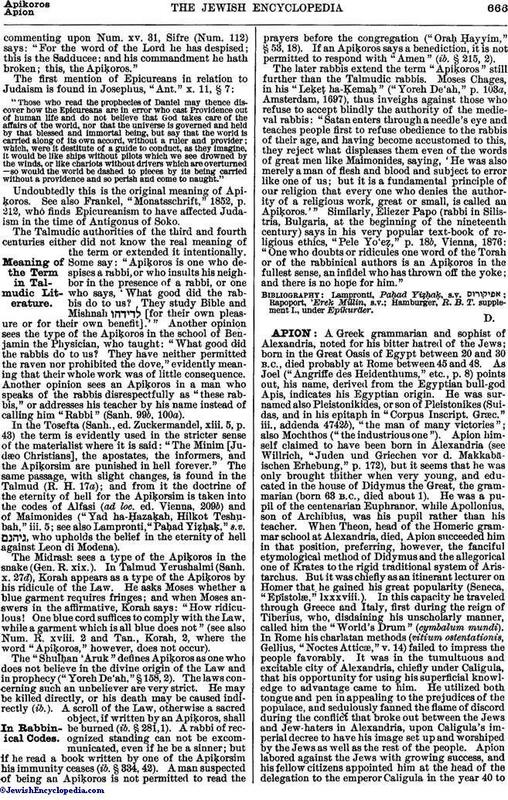 The same passage, with slight changes, is found in the Talmud (R. H. 17a); and from it the doctrine of the eternity of hell for the Apiḳorsim is taken into the codes of Alfasi (ad loc. ed. Vienna, 209b) and of Maimonides ("Yad ha-Ḥazaḳah, Hilkot Teshubah," iii. 5; see also Lampronti, "Paḥad Yiẓḥaḳ," s.v. , who upholds the belief in the eternity of hell against Leon di Modena).